from Reports of Presiding Elders, 1873 Conference: Cañon City has been depressed on account of the uncertainty of its railroad connections, and that has had a discouraging effect upon everything. The pastor of our Church there, E. C. Brooks, labored with many discouragements, but toward the end of the year, in an effort made by all the Churches, God was pleased to bless them, and a gracious revival gave hope to all. The town is reviving in business, and our prospects are excellent. It is a place of great beauty and healthfulness, and deserves our fostering care. Rev. Brooks came to Colorado in 1869. He labored at Golden and at Laramie, Wyoming, before going to southern Colorado. His experiences are related here from an article in the COLORADO MAGAZINE Vol. VI, No. 3 (May 1929). "When the list of appointments was read at the Methodist Conference in Denver in 1871 my name was announced for Canon City, by the Rev. George Murray as my Presiding Elder. I found our church building was what had originally been a store building. The room was built of stone and was about twenty-four by forty-five feet. A large room was in the rear and built on to it was a rude board shanty which, together, gave us a five-room parsonage. It was built of cottonwood lumber, and was very densely peopled with little, flat bugs that could prove very annoying. The Colorado penitentiary had just been built, consisting of one wing of three tiers of cells, twenty cells on each tier. Colorado being still a territory, the prison was under the control of the United States marshal, who was then Mr. Shaffenburg. He has Messrs. Walters, Dueber and Rice as guards. The marshal wrote asking me if I would preach to the prisoners on Christmas day. I did so and held the first religious service in the Colorado penitentiary on Christmas day of 1871. He then asked me to serve them regularly every Sunday, which I did and had the privilege of organizing a class of thirteen converts out of a prison population at the time numbering about thirty five or forty. One of the boys was a son of a missionary in India. My work included what is now Florence and settlement on Hardscrabble. We had at Frazierville (now Florence) a log building for a church. The seats, running around the walls of the building, were made of hewn logs. While I was pastor here, I went with Brother W. R. Fowler across the country to Colorado Springs to meet Rev. Dr. Crury, who was coming to us as our Presiding Elder. When I was a boy Dr. Crury was my pastor in St. Paul. When night came we camped on the banks of a creek between Canon and Colorado Springs. Brother and Sister Fowler slept in the wagon bed while the Doctor and I made our bed on the ground under the wagon. I had just got asleep when the Doctor punched me in the side, waking me, and said, "Ed, Ed." I answered, "What is it?" He replied, "This is jolly." He let me go to sleep again, when I was again awakened by a punching in my ribs and the Doctor calling, "Ed, Ed!" "What is the matter now," I said. "Why, Ed, this is good enough for a dog." He then allowed me to finish my sleep. The old Doctor was very fond of the water in the mineral spring at Canon. He had been holding quarterly meetings at Fairplay and I met him at the spring. He said to me between drinks, "Ed, if hell is any worse place than Fairplay, I am going to try mighty hard to keep out of it." The conference session of 1872 was held at Georgetown. I drove a team consisting of my horse and a mule and in a covered wagon my wife and I made the trip via South Park. Our second night out, in the midst of a driving rainstorm, we reached the salt works, and went into camp. From Granite, we drove to Twin Lakes. When crossing the stream between Granite and Twin Lakes our mule seemed to think it wanted to stop and rest a while. I felt the wagon beginning to sink in the sand, so I climbed out on the wagon tongue, the water coming up to my waist, and by dint of great physical urging persuaded the mule to continue the journey. While at Georgetown a number of us made a trip to the summit of Gray's Peak, and played snowball, on a hot August day, across the backbone of the continent. At this session of the conference my brother, the Rev. 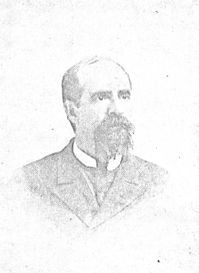 C. A. Brooks came to Colorado and was appointed by the bishop to the Wet Mountain Valley circuit. He remained in Colorado until his death in March, 1928. I was returned to Canon City and labored to build up Methodism there. In 1873 I was appointed to the Las Animas region. I reached there and found my circuit extending from the mouth of the Apishapa to Granada and from Las Animas up the Purgatoire to Kit Carson's ranch--one hundred and fifty miles east and west by fifty miles north and south. I had preaching appointments at Rocky Ford, where there were six members of my church; then at Lavender's, where there were three; then where La Junta now is, in the log cabin of Ed Smith and wife, who constituted the class; then at Price and Lander's, Las Animas (old town), the Meadows, Granada, and one or two cabins on the Purgatoire river. The railroad came to the river at this time and the town of West Las Animas was built. Threats were made by the Indians that the town would be wiped out. A war party of three hundred Cheyenne Indians came for that purpose, but Mr. John Prowers, whose wife was a member of that tribe and who himself was very popular with the Indians, met them and persuaded them to abandon their purpose. It was to us a night of intense anxiety, as just before sunset, standing in the door of our house in Las Animas, looking off to the southwest, we was that long file of horsemen with their guns, riding along the ridge. Mr. Prowers had them stop at his ranch, had a large number of his cattle killed, and feasted them all night. The next morning he brought a number of their chief men over to the fort and thus saved that whole section from destruction. Ill health shortly caused me to resign my charge, and in the spring of 1874 my pioneering in Colorado came to an end and I removed to Kansas. I remained there until 1884 when I retuned to Colorado, and while I was preaching at the town of Henry (now Monte Vista), and Del Norte, the legislature created the office of chaplain in the Colorado penitentiary. My old friend, the Hon. Benjamin Easton, appointed me to the position, and so having had the privilege of preaching the first sermon in the penitentiary on Christmas day 1871, I was honored with the position of the first officially appointed chaplain of the institution. I spent two years there, with General Cameron as warden. In the spring of 1887 I left Colorado and moved to Iowa, where my home has been ever since."